Editor's Note: This article was sent to us by Dr Sam Chachoua. It had been published in a magazine called Explore. We do not know who the author was (we thank her/him) and we are re-publishing it here because the world needs to know the truth, especially when the moneyed powers want us to think different. The images included are really for professionals to look over. Most of you won't have a clue as to their meaning and I don't blame you. For most of last year (2006) the world was enthralled, panicked and held for ransom by the most obvious medical fraud ever enacted on this planet. Precise orchestration led to the creation of an adversary easily defeated and the diversion of billions of dollars heaven knows where. The bird flu is still a vivid memory to many but the fear is gone, travel restrictions lifted and life is back to normal. Well, sort of, poor countries are poorer, hungrier and more desperate than ever before. Why? How? Whatever happened to the plague that was promised only to melt in the haze of distant memory? How could the unbridled audacity of major countries reporting on measures 'to restrict the outbreak' and provide funds to those effected go unnoticed when African countries went un-assessed until almost an afterthought at the end of the 'catastrophe'. These nations were not even invited. Check that…actively removed from meetings for evaluation of the impact of bird flu to fund raising events that they could not hope to contribute to. A Liberian Senator told me "people die in the street…is it from aids?....Malaria?....Bird Flu?....no one knows or has lifted a finger to care. How can they say the disease is contained when no one will see what is killing my people?? We sent our brightest representative and he was not even given a voice; our country slighted and rejected from participating in the world conference our rich neighbors show signs of the disease but out of the billions raised will anything be sent to study our birds, our people or should we hope that the virus shows clinical racism, outbreak prejudice, or the snobbery to only effect the nations with money or those that can raise money. Imagine a virus that will only effect the birds of white and yellow people but not black! Even the above outrage did not begin to scratch at the truth. In our time a disease was generated before our eyes for the sole purpose of raising funds. How many people died from the bird flu outbreak of 2005/2006?…one hundred...two hundred...how many exposed?…One billion ...two billion...more?? This disease effects only one in every 10 million people exposed. To this disease yet in 2 days it raised more money than Cancer, Aids or even hunger; Malaria Heart Disease ... Real killers accounting for almost all human death and the fear it generated dwarfed even these giants. We do not live in a vacuum. Our actions affect those around us regardless of race, color, creed or even life-form. The influenza cycle has existed for as long as humanity has existed. Every year, this hardy virus breaks out on one part of the planet; stays there for a while then disappears. Where does it go? To Hawaii for the holidays? The Flu cycles...between nations...between life-forms. ; birds and pigs amongst others can bear the brunt of a viral disease when it is 'hibernating' away from humans. That is where Swine Flu comes from. We do nothing to eliminate the Influenza Virus during an outbreak. We have no effective medication. We do not employ quarantine or other measures of disease control. So how does an outbreak...burnout?? It is a well known scientific phenomenon that only a percentage of population needs to be immunized against the disease in order to confer herd immunity. Not everyone gets vaccined against the flu but last year’s flu season prove that if enough of the herd was immunized, the entire population avoids the flu. Statistical, there is a threshold of percentage immunity above which an infection would find it hard to propagate. The effects, however is not a précised mathematical equation and therefore there is a biological component where cross-resistance or resistance against another entity may immunize both and/or protect against the first. Viral interference can also result in herd immunity. Viral interference occurs when one virus interrupts, prevents or displaces another viral infection. Smallpox for example was finally eradicated not by vaccinating against Smallpox but by a vaccine made from Cowpox which prevented the more lethal virus from entering the system. The phenomenon of herd immunity can be described for almost every disease known and its mechanisms range from genetic, immunological to biological. Areas of the Middle East were decimated by Tuberculosis centuries ago. Many of the survivors pass genetic immunity to their offspring donating a herd immunity that to this day has kept large areas Tuberculosis free. Malaria remains the major killer on a planetary scale. Some Africans, however carry a Thallasemia trait which confers immunity to Malaria. Thallasemia is a disease that changes the shape of red blood cells making them more of a crescent than a circle. This in effect does not give enough space in the red blood cell to house the Malaria parasite. If there is a genetic disorder thought to have evolved to confer resistance to Malaria and where there are pockets of Thallasemia in a geographical high concentration, that population is generally free of Malaria. We are all familiar with healthy lifestyles conferring benefits and preventing disease. However, the mechanisms spoken of above override the dietary and even environmental factors and can give strong guidance not only to preventative mechanisms but also curative ones. By example, Japan has had two nuclear bombs dropped on it and the incidence of smoking supercedes almost all other countries. Despite radiation and the obvious hazards associated with smoking, the Japanese have amongst the lowest incidences of Lung Cancer on the planet. In fact, that cannot be accounted for by diet alone. Herd immunity therefore gives rise to a very simple dogma/ if you want to find an effective preventative and therapeutic agent against a certain disease, look for where the disease isn’t and try and isolate unique factors about the location and the population that can account for disease absence. Dr. Chachoua first published his “NEMESIS THEORY” in the 1980s and wrote a book about it in 1992. His teachings have only recently been taken seriously by conventional medicine some two decades later (“Biotechnology: Can A Virus Kill Cancer?” Popular Science, April 2005 article reports that UCLA was conducting trials using viruses to kill Cancer). It is very important to understand why this theory of medicine represents an important paradigm shift and also helps to explain how Dr. Chachoua’s claims to have found effective therapy against so many diseases may be true. The search for new breakthroughs is increasingly one of intricate and intimate detail. Gene sequencing, metabolic definition and isolation and molecular pathways, once a closely guarded secret of micro-organisms, have divulged all their detail in the face of modern science. This in turn have given new points of attack and amazingly complicated avenues for resolving disease. The problem is that we have all evolved out of the same primordial soup and although distinctions can be made amongst species and races, the similarities between living cells of a complex nature and even the most primitive virus are such that targeting a unique system in a disease without repercussions being felt by healthy cells is almost impossible. One would think that a virus such as HIV is so primitive and insignificant compared to the hardware carried by a normal human cell that finding specific viral enzymes and pathways to interfere with would lead to safe, effective therapy but the side-effects of even the most sophisticated and specific antiviral therapy are almost as staggering as those of the most primitive chemotherapy regiments used in the early days of Cancer treatment. So closely interwoven are our life-cycles with those of microbial invaders that even when we think that we have targeted new process unique to the disease, the treatment can be fatal to the host as well. With endless sequences of genetic material being analyzed and new information coming to light, the science of medicine is increasingly one of fine detail. All of the great medical discoveries in the past have been due to serendipity where the fortunate deduction from a readily observable phenomenon with classic examples being generous Cowpox vaccine, the discovery of Penicillin, Chloroquine and other great breakthroughs. Our planet has had millions of years to create and separate host-disease interactions and although the detailed research of current technology will eventually yield a solution, that solution may be years or decades away. Clues to curing disease today abound and the concept of herd immunity and nemesis theory allows one to look at a stack of needles surrounding a straw of hay. For over two decades we have struggled to bring out a vaccine and protect our population from this plague. However, HIV is unlike any infection we have previously encountered in that the stronger the immune response against the virus, the easier it is for the virus to enter into the system and demolish it as it feeds on the very cells that attack it. This makes all current protocols aimed at raising cellular and antibody based immunity suspect. The fact that Aids allow superinfection sets it apart from most viral diseases. Superinfection essentially means that having one strain of HIV and even a degree of immunity against that strain does not prevent the second strain from entering your system, or a third, or a fourth etc. In short, specific anti-HIV immunity cannot be considered along the same lines as other infections as standard immunity is not protective (“HIV Hybrid Formed In A Human Revealed” New Scientist; 18:47, 18th July 2003), with all current approaches to vaccinate against HIV use fragments of HIV or even weaker virus to stimulate an immune response that all of our science now tells us can only be detrimental (“Killer Cures” The Times; February 19, 2005). Millions are being spent now in injecting weakened strains of HIV into healthy people in Africa in the hopes that it will protect against the deadly strains of HIV in nature. This however is bad science as we already know that superinfection is a daily occurrence and that injecting healthy people with even a weakened strain of a killer virus famous for its ability to mutate into an aggressive form is morally reprehensible. The above is not a sign of medical advancement but rather of medical desperation. If one were to follow the teachings of the Nemesis Theory and the observation of the Herd Immunity, one can easily isolate geographical locations where Aids is almost non-existence despite the prevalence of risk factors. One can then begin to look at specific teachers of the population that may confer resistance. Dr. Chachoua first isolated areas of Mexico, Northern Europe and Africa that seem to be suffering a considerably lower impact by the disease than their neighbors. Painstaking demographics and life-style studies as well as laboratories investigation reveal not one but many factors that can confer specific and herd immunity against HIV. Some of the unique factors in these areas could be classified as physical, biological or chemical. The biological ones are of greatest interest in this article as they led to the development to some of the most powerful vaccines known to man. There are farming communities in Mexico where goats are routinely infected with Caprine Arthritis Encaphalitis (or CAEV for short). The infection may be sub-clinical that the virus can be transmitted through milk and can create long term infection in humans that has not ever been shown to cause disease. All of the farmers tested and shown to have been exposed CAEV carry almost a 99% resistance in their blood to being infected by Aids because of the phenomenon of cross-immunity and because CAEV can actually interfere with HIV replication. In Africa, there are viruses that belong to the Togavirus group. That, like CAEV can create Arthritis-like changes in animals and even in humans. Where these diseases are endemic, Aids incidences can be ten to a hundred times lower than that of the surrounding neighbors. The Arthritis observation in important and it seems that people with autoimmune disease including those with Rheumatoid Arthritis are highly resistant to HIV infection. 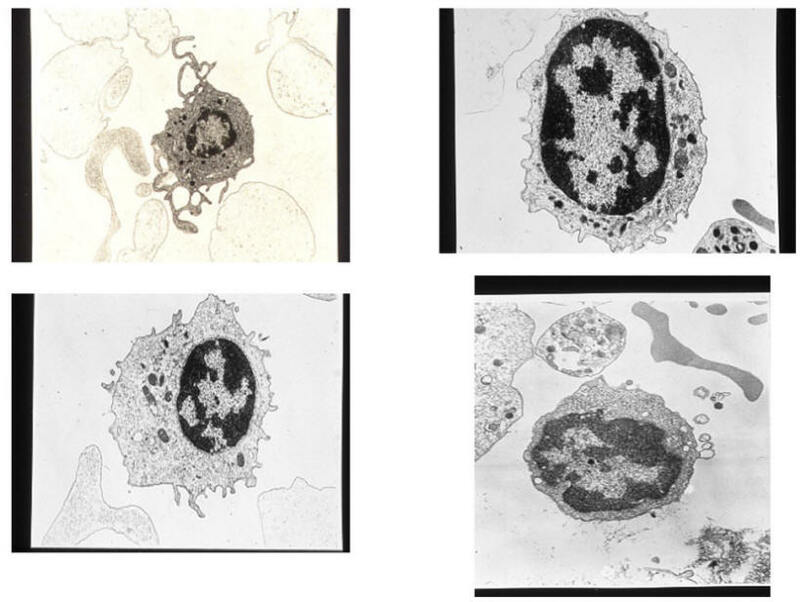 Dr. Chachoua describes an immune response in these conditions which were not only preventative but could also be trained to enter a cell and remove or destroy HIV and other viral fragments within it. The ability of one virus to interfere with another can be primary, as in direct interference between two micro-organisms, or secondary to changes induced in the host. If CAEV or Toga virus seems scary and untested, it would be a misunderstanding as nature has tested these illnesses in hundreds of thousands of people already and their track record of safety under controlled conditions is unrivaled. However, let us consider more familiar friends. The study of antisense RNA is currently at a peak (“Antisense RNA”; The Science Creative Quarterly; April-May 2006). The idea is a simple one but incredibly complex in execution. If gene sequences needed for survival code for specific sequences and pathways, then ones that code for nothing (antisense) can be created to bind to them and inactivate them. Whereas antisense gene therapy may seem new, Measles, Mumps, Rubella and even Ebola have employed antisense genetics as one of their pathways of reproduction and protection against hosts and other micro-organisms. Measles and Mumps infections have been shown to create dramatic reduction in tumor load in Cancers as varied as Ovarian Cancer and Leukemia. A recent study in India showed that children suffering from HIV whom were infected with Measles have a massive reduction in HIV count and the rise in their T-Cell function during the time that the Measles virus is. This could be the most obvious example of nature employing antisense therapy and out of all of the swamp of noise and confusion surrounding Aids prevention and treatment, what could be easier or even cheaper than periodic administration of purified fragments of the Measles vaccine to interfere with, prevent or even treat HIV infection. We have seen now that multiple biological conditions and even infections can interfere with other, more deadly diseases and we have seen that an entire viral family can create resistance to Aids. That is not to say that nature cannot be helped a little bit. HIV knows permissive and expressive cells as well as cells that are not permissive or expressive. This means that not all cells can be infected by (permissive) or can grow (expressive) HIV. This is one biological model that can be used to create a survival advantage in the competing viral culture so that after serial pathogens, the conditions favor the growth of the competitive virus or micro-organisms and can lead to the development of the strain that can displace and destroy HIV. Working with the raw material that nature gives us is more than enough to outdo the most powerful Aids therapy currently available and even yet this raw material can be refined by selective culture procedures to yield the magic bullet. CAEV and Feline Panleucopenia Virus (FPLV), Rubella, Measles, Mumps, Cowpox and all of their related counterparts as well as many other micro-organisms where processed and purified by serial culture to yield prime cultures with activity against Cancer and Aids by Dr. Samir Chachoua. 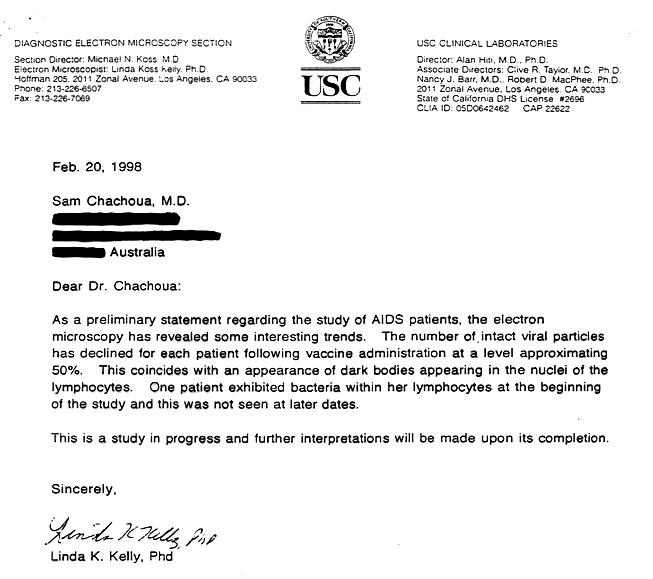 CAEV, in its crudest form was of particular focus when these cultures and techniques were presented to Dr. Eric Daar at Cedars-Sinai Medical Center, as CAEV have already infected hundreds of thousands of people with no obvious harm and would have been the ideal candidate for intensive work in the making of an Aids vaccine. The beauty of Dr. Chachoua’s technology is that it does not simply target proteins on the outside of the disease at an area of attack as most vaccines do. His technology targets everything form the inner most genetic and metabolic pathways and structures, to the outer appearance of the disease as well as the pathways of disease propagation and host destruction. It is for that reason that in 1996, the results obtained in the testing of 32 of his vaccines preparations were at the time and to this day unheard of. Almost all of the preparations tested had over 99% efficacy in the inhibition of not one but both strains of HIV against which they were pitted. Vaccines characteristically, can only address one superficial structure or one strain of the disease. HIV”s ability to mutate and change its superficial structure is intimate to its ability to evade the immune response. It seemed that there was no evasion of Dr. Chachoua’s vaccine was possible because every aspect of viral structure and life cycle was being simultaneously targeted. CAEV was similar enough to HIV to create an immune response that would neutralize Aids but also was similar enough to incorporate itself in all of its host cells and tissues to literally not allow HIV to enter the host’s body. Another unique feature was that the unprecedented safety of these vaccines and therapeutic structures in that at treatment dosage, healthy cells up to double the number as opposed to showing any signs of toxicity. At the same time that Dr. Chachoua approached Cedars- Sinai Medical Center, he had already been involved several years in discussions and testing at UCLA with Dr. Paul Terasaki. Paul Teresaki is a leader in the field of transplantation and tissue typing. Dr. Chachoua was very interested in Breast Cancer and Ovarian Cancer for two min reasons, the first being an obvious relationship between the size of the tumor and the ability to mount an effective immune response against it. We have also seen that they may have carried a viral cause and/or hitchhiker or some genetic mechanism that allowed them to convey immunity against HIV. Any obvious micro-organism might easily stimulate an immune response of those surrounding the patients and Terasaki was asked to study the effects of Lymphocytes transfusions in mothers with Ovarian Cancer where the donor would be one or more of her children. The reasons being that Ovarian Cancer tended to be more uniform and run a longer course of action than Breast Cancer which would allow family members to be exposed to whatever micro-organisms that may be expressed by these Cancer cells and create an immune response against it. It was also possible that by the sheer volume of added immune response, Cancer remission might result. To his credit, Terasaki almost immediately began the clinical testing. To his shame, he terminated the protocol after obtaining outstanding results and then not only denied Dr. Chachoua’s role in the work and refused to even speak to him from that moment on but smugly watched the patients die one after the other when he knew from Dr. Chachoua’s data and his pleading that a second or third transfusion may have resulted in the mother’s cure. His interests was only to being the first to publish the paper. The human value seemed irrelevant. That should not be considered as surprising. Terasaki achieved fame as part of the transplant group that traveled to Russia after Chernobyl to do bone marrow transplants on those affected by radiation. The instant glory and daily news coverage must have been euphoric. The truth, however, that he was simply experimenting and made an agonizing death even more horrible was never to tarnish the reputation of this hero. Not one of the Russian recipients survived. When Terasaki’s article was about to be published, UCLA and Cedars-Sinai Medical Center took unprecedented steps in removing any contact or knowledge of Dr. Chachoua and denying his input in any of their work. They took the unprecedented step of terminating and denying the relationship with Dr. Chachoua. This coincided with the release and publication of Paul Terasaki’s article in April 1996 (“Lymphocyte transfusion therapy for Cancer Patients” Blood, 1996 Apr 15; 87(8):3522-3 – Boasberg PD., Tokita KM, Terasaki Pl, Wang X). There was another reason for the interest in these tumor types (although Dr. Chachoua’s work with Terasaki also extended into Leukemia and other Cancer types), there seem to be something about certain Cancers that conferred resistance to HIV infections and Ovarian Cancer culture revealed giant syncithia formation characteristic of viral infection. Fluid and Cancer tissue extracts obtained from Ovarian, Uterine and Breast Cancer patients seem to not only confer immunity against HIV in cell cultures but also to destroy HIV in a test-tube. If there was a viral agent involved in the etiology of these diseases, then that would account for at least some of the success of Lymphocyte transfusion. It would also suggest that several Cancers may contain viruses and/or microbial fragments with enough similarities to HIV that they could interfere with the disease. On a simplistic view, it may even suggest that Ovarian Cancer extracts or other Cancer cell extracts can be used in the manufacture of vaccines against HIV (theoretically injecting a man with Ovarian or Uterine Cancer cell extract may protect him against HIV without any real risk of developing Ovarian / Uterine Cancer). That is applying the principles at the crudest levels. First, one needed to show that there seems to be some statistical inhibition of Aids infection or at least an inversed relationship between Ovarian Cancer, Uterine Cancer and Breast Cancer and HIV and then one needed to isolate why. If the Cancer contains an infection that interfered with or neutralized HIV, then one would expect that where one dominates a particular geography, the other would be almost extinct. Interestingly, the highest incidence of Breast Cancer in a developed country belongs to Iceland (“Trends in cervical and breast cancer in Iceland. A statistical evaluation of trends in incidence and mortality for the period 1955-1989, their relation to screening and prediction to the year 2000” Int. J. Cancer Jun 19;48(4):523-8) whereas the lowest incidence amongst developed countries for HIV is also Iceland (“Iceland - HIV/AIDS country profile” WHO Report December 1, 2005). Aids is characterized by higher incidences of many Cancers by up to seven to tenfold increases more so than the general population. However, Ovarian and Breast Cancer occur much less frequently in Aids patients than they do in the normal population. Again, one must remember that interference is not absolute and may need to be honed in a laboratory. One must remember that a reduced incidence of Cancer in a disease characterized by total lack of immunity is a very significant observation. Uganda, in contrast had amongst the world’s highest in HIV and accordingly one of the world’s lowest incidences of Breast Cancer. It also appears that as HIV incidence began to drop, the amount of breast cancer increase proportionately (The timing and percentages may not be précised as multiple other diseases and Cancers may be involved). Similarly, in Uganda where Aids is rampant, breast Cancer levels are drastically lower than the rest of the world. Conversely, where Breast Cancer started to increase (11:100,000 in 1961 to 22:100,000 in 1995 and continues to increase – “PRACTICE POINTS: Breast cancer guidelines for Uganda”; African Health Sciences Vol. 3, No. 1 (2003)), HIV has been decreasing (15% HIV incidence in 1990s down to 5% HIV incidence in 2001 – “HIV & Aids in Uganda”; http://www.avert.org/aidsuganda.htm). It was years later that researchers isolated RAK antigens and gene sequence from Breast Cancer and Ovarian Cancer as well as Uterine Cancer, that have over 99% homology and similarity with HIV (“Human Immunodeficiency Virus Type 1-Like DNA Sequences and Immunoreactive Viral Particles with Unique Association with Breast Cancer”; Clin Diagn Lab Immunol. 1998 September; 5(5): 645–653). In 1998, the researchers were brave enough to conclude that the long search for viral cause of Breast Cancer may be related to HIV. Of course, it would not be prudent to inject people with Cancer cell extracts although by any standards, these would be safer than any preventative or therapeutic modalities but we are only walking down the historic pathway here. We are just telling a story. The ultimate climax and resolutions of all of these clues into effective treatments is still to come. What I am endeavoring to do however, is to show the evidence and the thought processes and the pathways that finally led to the development of Induced Remission Therapy and evidence of its efficacy. I am also trying to show where the timeline and the stumbling blocks and the hurdles that have been faced by Dr. Chachoua. For any treatment, there needs to be logic and proof and there needs to be evidence and for the public, there also needs to be an explanation as to why this treatment is not out there. The lines of thought that we have pursued in this article are far from the conclusion and where it leads will both stun the public and surprise even the most cynical. But today’s article has threads that tie to the present day. We began this article speaking about the Bird Flu and about the African Senator whom was indignant that their speaker was not allowed to participate. It should come as no surprise that having actively developed protocols and actually initiated treatments that resolved many local health issues, Dr. Chachoua was elected by not one but two African countries to be their representative at the Bird Flu Conference in Beijing. His initial speech and pledge of USD$3 million (three times the amount pledge by Saudi Arabia) received a standing ovation from all those present and his simple solutions to the Bird Flu, some based on Bird feed additives and others based on viral interference vaccines (Newcastle’s Virus and related vaccines, routinely given to poultry, if administered during an outbreak of Bird Flu would prevent Bird Flu infection and eradicate it), received a standing ovation from all those present and was even described by the Chairman as riveting. It was a prelude of however, a longer presentation he was to give the following day and although it touched of dangers of the current approach to Bird Flu, it also focused on how it could be neutralized. We mentioned earlier in this article that we do not live in this vacuum. It is no coincidence that the Bird Flu outbreak began after a massive human flu vaccine campaign. If the virus exists between two distinct population and one population (the humans) is suddenly given massive immunity, then the virus is forced to mutate and express itself in a non-human host (the Bird). Heaven help us when a specific H5N1 vaccine (Avian Flu) is given to immunize the poultry population, as it would be the human population who would then suffer the consequences. The night after introductory speech, Dr. Chachoua’s invitation was canceled and he was told in no uncertain terms that neither he nor the country he represented would be welcome at the presentation. The events to follow just fell short of creating a Diplomatic incident but at the root of everything, with the Cedars-Sinai Medical Center and the UCLA claims that Dr. Chachoua had never conducted any work with them and that he was essentially a fraud. I was present in August of 2000 during Dr. Chachoua’s lawsuit against the American Institutes. I remember not only the human side of Dr. Chachoua as he rushed to help a jury member who had tripped and fallen at the feet of Dr. Eric Daar (Daar in contrast did not bat an eyelid as the middle aged African American women layed at his feet injured). I was also witnessed to how lies and deception fragments. At one particular point, Daar denied any relationship with Dr. Chachoua. However, he soon after boasted that Dr. Chachoua would not be able to publish any of his work without his consent as chief collaborator. Dr. Chachoua has in fact attempted to publish in over twenty medical journals that have rejected him based on representations made by UCLA and Cedars-Sinai Medical Center. In a nutshell, that explains the “why haven’t I heard of this treatment from my doctor?” the question that always arises when people first hear of Dr. Chachoua’s work. UCLA and Cedars-Sinai not only initiated a worldwide media campaign involving newspapers and television to defame and dishonor Dr. Chachoua and denigrate him in the public eye claiming that they have never worked with him or even heard of him (despite almost 6 inches of correspondence and proof that led to their downfall in court). But also they have been active in the medical circles, preventing him from publishing any articles in any journals. Daar even boasted about this in open court. The same letters handed to the media and the same representations that Dr. Chachoua was a fraud, was handed to the Chinese government and yielded the expected results. The silencing of Dr. Chachoua at any cost to him or to those who must die because they cannot access his work. I have personally spoken with UCLA and Cedars-Sinai researchers. They have told me without any shadow of a doubt that they believe that Dr. Chachoua to be a fake and that his work is baseless. They even made these open representations in Court as did members of Quackwatch. It is interesting therefore to note the similarities between documents UCLA and Cedars have confirmed are real (99% charts) and the published article by Daar and Angelina Douvas and the subsequent multimillion dollar patent by Douvas. It is one thing to say that someone’s technology is worthless, it is another to say that and claim that ‘worthless technology’ as your own. Dr. Chachoua’s work at USC where the virus was removed from the cells of five Aids patients is still ground breaking. More importantly, it is logical and the efficacy easily and repeatedly shown. A question for you to ponder prior to the next article “when is blood infected with HIV, when and where can certain Cancers occur with almost 100% remission? And what is our inbuilt human defense that enables this and that can eliminate the deadliest of diseases? Some lies are obvious. I would hate for this article to be seen as just another conspiracy theory and suppression because I don’t honestly think that there has been any developments in Medicine and science with the possible impact of Dr. Chachoua’s that have been suppressed. The Rife technology for example has received huge amounts of publicity but even those who practice it in its heyday has doubts about its efficacy but certainly not one patient today which has been cured of terminal diseases by use of frequencies technology. It is just that unlike the medical martyrs of the past who lived their lived in obscurity only to be resurrected as Saints and saviors when their supposed technology is lost, this story is playing out before us in real time so we can see everything as it develops, we can evaluate the technology as much of it is still here, and we can see the suppressive mechanisms. Cedars and UCLA have NEVER united in their entire history to challenge and attach the researcher and yet they attack Dr. Chachoua and continue to do so in order to protect their stolen patents and publications. The first attack occurred in early 1996 which happens to be days before Terasaki’s article was published. The second attack unprecedented by any respectable institute for the local and overseas media occurred in around the middle of 1996 which was only a few days after Eric Daar publish his article claiming all the credits for the CAEV discovery. Some lies are just obvious if only the truth were as loud. Our next article will delve more deeply into the theories and practice of Induced Remission Therapy and discussed in detail the technology behind this breakthrough. A little bit of the history will also accompany. These revelations in Explore magazine has been many years in coming as the patent and contract battles between Dr. Chachoua and UCLA,Cedars-Sinai place him in an impossible situation of having to reveal trade secret technology imparted to Cedars-Sinai in order to prove his case that they stole his technology. However, in divulging it publicly, he would then relinquish all rights to patent and trade secrets as the lawsuit had made it public property. In other words, Dr. Chachoua in the lawsuit was required to reveal all of his trade secrets to his opponents and to the public, that would automatically nullify any claims that he has as far as damages and weaken his chances or recovering the material and technology stolen from him. Why reveal these now? With publication of trade secrets and patent worthy material, no pharmaceutical company would have any incentive or mass manufacture and distribution of these material. Why expose this technology now? Because all conventional avenues have been exhausted…because enough people have suffered…because enough people have died. After claiming the CAEV technology for Cedars-Sinai Medical Center and for USC, what has happened in the way of human benefit over the past ten years? NOTHING! A proven technology far ahead in efficacy and safety than all others that are currently being pursued has been restricted to laboratory research and once a respected Institute attained their patent, they have effectively sat on this for almost a decade. Editor's Note: The following is a note from Dr Sam to me that came with the article. 1. People who are resistant; situations where the virus is rejected. 2. geographical areas of low incidence amongst a sea of aids. 3. viral competition and displacement. HIV is actually a great immunostimulant but a better immunodestructive agent. It generates a massive immune response but destroys it so quickly that immunedepletion results. The last thing you want to do is stimulate the immune system further because that just accelerates the immune destruction. That is the basic problem with all vaccine techniques being tested. Even if they work to attack the virus; they just launch a response that the virus can easily demolish. The worst science ever employed was by the advisers to Mr Gates who initiated a program of vaccination with weaker HIV in the hope that it won’t kill the subject as fast as the wild strain. HIV mutates rapidly and the vaccine only guaranteed death to people previously healthy through superinfection. HIV dating services for infected couples has given us this vital piece of information. We’ve seen that an infected person can still be affected by a partners strain and develop this superinfection. This alone advises that normal vaccine strategies cannot work. People who are resistant to HIV are those with diseases such as autoimmune disease. Immune factors generated by them are deadly to HIV. This includes rheumatoid factor. Slight modification of this enables a powerful passive vaccine that can be applied 2 or 3 times a year at a cost of 50 to 200 dollars per treatment depending on dose. People who reject HIV occur everyday. They are the babies of infected mothers. They share the same blood but are usually born disease-free. This is because of powerful enzyme and antiviral immune mechanisms in the embryo and placenta. Protease inhibitors such as antitrypsin are cheaper and more effective than current pharmaceuticals and are employed by the embryo along with leukemia inhibition factor and selective activation of endogenous viruses that protect against HIV. surrounded by countries drowning in HIV. Mexico is a more current situation where CAEV, a virus of goats infects people and gives them immunity against HIV. This virus has been tested by nature against thousands and proven safe. Vaccines against HIV show efficacy within hours of application when based on my techniques. I will; send an attachment in my next email. Thank you for all your help, David. The invention provides a polynucleotide comprising portions of the genomes of caprine arthritis-encephalitis virus and HIV-1, resulting in a chimeric retrovirus referred to as a "CHIV. " The invention also provides a vaccine comprising a CHIV immunogen and a pharmaceutically acceptable carrier. A method of stimulating an immune response in an individual-against human immunodeficiency virus-1 infection by administering a therapeutically effective amount of a CHIV immunogen is also provided. The invention further provides a method of stimulating an immune response in vitro by contacting a lymphocyte with a therapeutically effective amount of a CHIV immunogen.